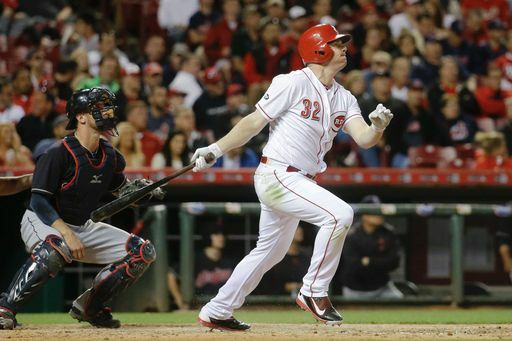 With two home runs tonight, Jay Bruce hit career dingers 127 and 128 at Great American Ball Park in Cincinnati, becoming the all-time leader; passing Adam Dunn. We’ve said it many times; Bruce has had an enigmatic career with flashes of brilliance. At the end of the day, it’s hard not to realize he’s accomplished quite a bit in a Reds uniform. It looked at that point like it would be a happy ending for one night in the Queen City; but Tony Cingrani and the Reds pen full of shitheads had other ideas. The Reds would go on to lose this ballgame 8-7 in 12 innings on a Francisco Lindor home run. Lindor is really a helluva a little ballplayer. You can see Lindor’s game-winning home run off Keyvius friggin’ Sampson by clicking here. That ball had some giddeup on it. The Reds try to get swept tomorrow in the Battle of Ohio Series. It won’t be easy, as Corey Kluber gets the start and he’s Jekyll and Hyde awful, but I think the Reds have it in them.